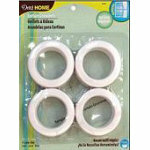 Curtain grommets for rods up to 138" diameter. For sheer to draperyweight fabrics. Machine Washable. Do not iron, tumble dry, or dry clean. Size: 1916" Diameter. 8ct per card. 3 cards per box. Purchase by the box.